Manhattan won their fourth game of the season after a 50-7 rout of Topeka West. Indians quarterback Ian Trapp finished with 309 totals yards and four touchdowns. Trapp rushed for 141 yards and a score, while passing for 168 more yards and four touchdowns. Despite staring at their first halftime deficit of the season, Junction City was able to rally and come away with a 36-13 win over Washburn Rural. The Blue Jays rattled off 28 unanswered points to turn a 13-8 halftime deficit into a 36-13 victory. 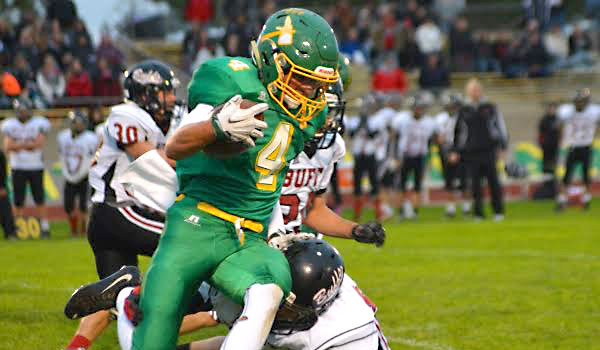 Senior running back Raye Wilson led the way for Junction City with 134 rushing yards and two scores. Olathe East extended its winning streak to three games after beating Shawnee Mission Northwest 25-14 on Thursday night. The Hawks defensive secondary collected six interceptions in the game. Garden City dominated Liberal 42-6 on Friday night to remain unbeaten on the season. The Buffaloes gave up a touchdown on the opening kickoff but scored the next 42 points on the way their 36-point win. Quarterback Jesse Nunez threw for one touchdown and ran for another for the Buffaloes. KC Harmon picked up its second win by doubling up KC Washington, 32-16. The Hawks led 24-16 at halftime and added a touchdown in the fourth quarter to complete the scoring. Darelle Alexander rushed for 145 yards and two touchdowns on 27 attempts to lead Harmon. Goddard improved to 2-3 on the year after a 29-6 win over Valley Center on Friday night. Lions quarterback Blake Sullivan rushed for 125 yards and three touchdowns and threw for 141 more yards in the win. Salina Central extended their winning streak to three games and improved to 3-2 on the season after cruising to a 51-13 win over Haysville Campus. The Mustangs had success on the ground in rushing for 554 yards and six touchdowns on the night. Senior Dalton Peters broke the 300-yard mark rushing for 302 yards and four touchdowns. Lansing moved to 3-2 on the year with a 29-7 win over KC Turner. The Lions defense held stout against Turner by shutting out the Golden Bears for the first three quarters before finally giving up their lone score of the game. Emporia grabbed their second win of the season with a 42-14 win over Shawnee Heights. Spartans quarterback Tanner Taylor rushed for two touchdowns and threw for another in the win. Salina South blanked Andover 49-0 to improve to 3-2 on the season. The Cougars scored 42 points in the first half behind an efficient night from quarterback Jacob Yarochowicz. Yarochowicz completed 9 of 11 passes for 191 yards and four touchdowns, including two scores to Jacob Marcotte who had four catches for 85 yards. DeAngelo Turner rushed for 129 yards and a score for Salina South. Hays took advantage of Wichita South mistakes and came away with a 16-0 victory on Friday night. The Indians forced five Titan turnovers, which included a goal-line stand from the one-yard line. Hays only totaled 167 yards of offense but got touchdowns from Shane Berens and Kohlton Meyers in the win. Louisburg scored two fourth quarter touchdowns to pull away from Baldwin in their 24-7 win on Friday. The Wildcats put together scoring drives of 57, 60, and 70 yards in the win. Louisburg led 12-7 at halftime. Augusta earned a road win at Galena on Friday night, 21-6. The Orioles outgained the Bulldogs 340 yards to 199 yards with 262 yards coming on the ground. Luke Dockers rushed for 126 yards and a touchdown for Augusta. Fort Scott took control early and cruised to a 35-6 win over Prairie View. The Tigers defense only allowed 26 yards and one first down during the first half. Carter Young rushed for 112 yards and two scores in the Tiger win. Kaleb DeLaTorre passed for 150 yards and a score for the Tigers. Prairie View’s only score came on a fourth-quarter, Trevor Hoover 94-yards kickoff return for a touchdown. Atchison remained unbeaten with a 39-18 win over KC Schalgle. The Redmen outscored the Stallions 26-6 in the second half to secure their fifth win. Wykeen Gill completed 9 of 15 passes for 130 yards and a touchdown, and added 28 yards rushing and another score. Parker Welch led Atchison with 59 rush yards and three touchdowns. Wichita Trinity grinded out a 19-7 victory over Cheney to improve to 4-1 on the season. The Knights totaled 334 yards of total offense for the game and were led by Sam Schroeder and Josh Osborne who combined for 246 yards rushing. Osborne also had two rushing touchdowns in the win. Girard improved to 3-2 on the season with a 35-8 stomping of Southeast-Cherokee. The Trojans were led by Trey Eaton who rushed for 148 yards and two touchdowns. Clay Center edged Wamego on Friday night 27-19. The Tigers rushed for a team total of 228 yards and four touchdowns in the win. Junior quarterback Kade Wallace led the way for Clay Center with 65 rushing yards and two touchdowns. Pratt improved to 4-1 with a late touchdown to beat Nickerson, 27-20. Freshman quarterback Travis Theis tossed the winning 45-yard touchdown pass to Hunter Kaufman late in the fourth quarter. Perry-Lecompton broke a 14-14 tie with two touchdowns in the fourth quarter of their 28-14 win over Sabetha. Mitchell Bond passed for 211 yards and three touchdowns to lead the Kaws. Isaiah Dark caught two passes for 101 yards and a touchdown, while Nate Bays added five receptions for 59 yards and two scores. Nemaha Central did more than just remain undefeated after their 27-13 win over Holton on Friday. The Thunder ended Holton’s 48-game winning streak in the Big Seven League. Ryan Hasenkamp led the way for Nemaha Central throwing for 172 yards and two touchdowns and rushing for another touchdown in the Thunder win. Garden Plain remained undefeated after coming out on top of a back-and-forth battle with Chaparral, 35-30. Nate Pauly led the way with 171 total yards and two touchdowns. Pauly is averaging over 20 yards per touch on the season for the Owls. St. Mary’s Colgan held on for a 28-21 win over rival Frontenac on Friday night. The Panthers relied heavily on their quarterback Ryan Cedeno as the senior led the team with 148 yards rushing and two touchdowns and threw for 71 more yards and another score. Colgan has now won four games in a row after an opening week loss to Galena. Hesston improved to 4-1 on the season a 55-8 rout of Haven. Zach Esau led the way with four touchdowns in the first half as the Swathers led 42-0 at the break. The Russell Broncos got in the win column for a second straight week with a 42-16 victory over Southwestern Heights. Russell led 20-0 at halftime and added 22 points in the fourth quarter to pull away. Quarterback Reshean Holloway rushed for 284 yards and four touchdowns on 25 carries. Holloway also passed for 115 more yards and a score. Efrain Chavez led Southwestern Heights with 111 yards rushing on 20 attempts. Despite some costly mistakes, Ellis came away with a 20-18 win over La Crosse on Friday night. The Railroaders had three more turnovers than the Leopards and had one touchdown called back, but still managed to squeak out the win. It was Ellis’ first win over La Crosse since 2003. It was the Railroaders defense that won them the game stopping the Leopards two-point conversion attempt to tie the game. Lyndon pulled away in the fourth quarter on the way to their 39-14 win over Oswego. The Tigers were led by running back Wyatt Fitch’s 115 rushing yards and three touchdowns. Valley Heights earned their first win of the season with a 34-30 win over the Valley Falls Dragons. The last four meetings between the Mustangs and Dragons have all been decided by six points or less. Valley Heights won 33-28 in 2014, 30-24 in 2013, while Valley Falls won 28-26 in 2012. Wabaunsee picked up its first win of the season with a 41-14 district opener over Onaga. The Chargers led 27-0 at halftime and 34-0 after three quarters. Sophomore Riley Tubbs rushed for 198 yards and three touchdowns on only seven carries to lead the Chargers. Elkhart outscored Sublette 16-0 in the second half to claim a 28-12 district win in Class 2-1A. Junior Shon Villa carried 41 times for 231 yards and four touchdowns in the win for the Wildcats. Villa also caught two passes for 31 more yards. Little River improved to 4-1 with a 36-20 win over Goessel. Peyton Harvey led the Redskins offensive attack with 122 rushing yards and two touchdowns. South Central cruised to a 44-14 win over Kiowa County on Friday night. Quarterback Gerald Morehead threw for a game high 286 yards and five touchdowns on 11-of-16 passing. The junior also ran for 72 yards and another score as well. Uniontown remained unbeaten after a 66-20 rout of St. Paul. The Eagles put up 20 or more points in the first three quarters, and have posted 50 or more points in four of five games this season. Tommy Joles rushed for 138 yards and six touchdowns to lead Uniontown in the win over St. Paul. West Elk improved to 5-0 on the season with a 20-9 win over Sedan on Friday. The Patriots rushed for 203 total yards and three touchdowns. Sophomore quarterback Cade Miller led the way with 122 yards rushing and two trips to pay dirt. Armando Gomez added 89 rush yards and a touchdown. St. Francis moved to 3-0 in District 8 with a 20-12 win over rival Atwood-Rawlins County. The Indians won the Yoke Bowl against the Buffaloes for the first times since 2009. Taylor Rogers rushed for 239 yards for the Indians. St. Francis led 14-12 at the end of three quarters and added a fourth-quarter touchdown to cap the scoring. Cole Sramek rushed for 143 yards and a score on 25 carries to lead Rawlins County. Ashland’s winning streak extended to four games after their 68-14 stomping of Bucklin. Reece Kay and Nathan Reimer led the Blue Jays offense as Kay threw for 111 yards and two touchdowns and Reimer rushed for 100 yards and two scores of his own. Beloit St. Johns-Tipton got back to their winning ways after a 36-6 win over Stafford to improve to 4-1 on the season. Junior quarterback Davis Dubbert threw for 211 yards and four touchdowns for the Blujays. Classmate Mason Eilert caught three of Dubbert’s touchdown passes. Hoxie improved their record to 3-2 with a 70-20 lopsided win over Wheatland-Grinnell. The Indians were led by Troyal Burris’ 107 yards and one touchdown. Senior Jake Heim had three short touchdown runs and passed for 114 yards and another score. Linn earned their first win of the season by exploding for 66 points in their 66-34 win over Southern Cloud. The Bulldogs held only a 12-6 halftime lead before scoring 54 second half points including 34 points in the final period. Junior Evan Bott rushed for 223 yards and five touchdowns, while classmate Kalen Richardson added 165 rushing yards and two scores. Axtell got a short touchdown run by Kaleb Buessing with 8 seconds left to break a 24-24 tie and beat Frankfort, 30-24. Buessing, a sophomore quarterback, completed 18 of 22 passes for 203 yards and a touchdown. He also rushed for 71 yards and two scores. Brice Koch caught 8 passes for 102 yards and a score for the Eagles. Jase Suther rushed for 125 yards and Adam Kenworthy scored three touchdowns on the ground for Frankfort.